When we set off on our roadtrip to Sweden, our sweet Febe turned 8 years old. 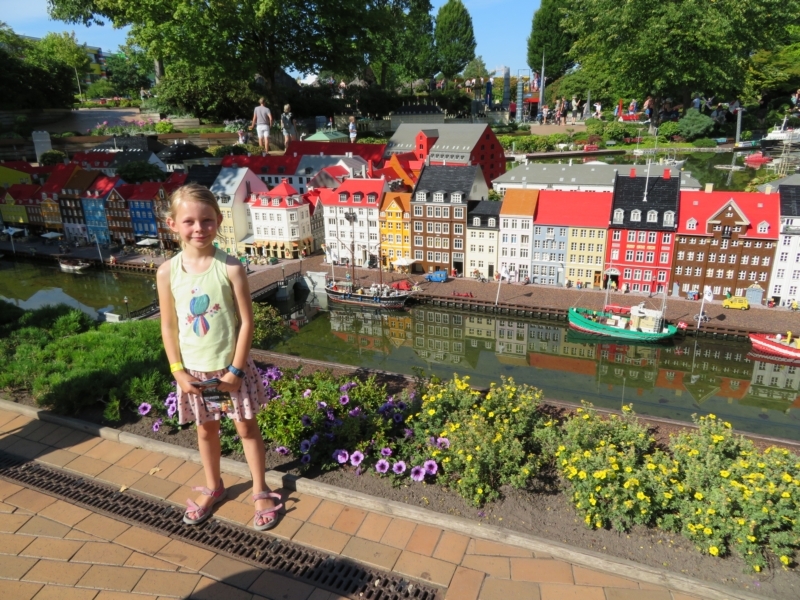 We thought it would be a great idea to give her two days in Legoland Denmark as a birthday present. We needed a stop along the way to Sweden, and we could make it fit that she was there right on her birthday. It turned out to be a very fun two days for Febe and for us. We have visited quite some themeparks in Belgium and have been to Eurodisney last year. But we can say that nothing beats Legoland. Here’s why! Although it’s only one park, unlike Eurodisney where you have Disneyland and Movie Studios, the park is huge. We really needed our two days there. Not because it was overly crowded, as you might expect on sunny warm days in July, but just because there’s so much to do. It all starts with a miniature lego world when you pass the entrance. It is really well-made and both children and adults love strolling around and taking a look at all the working items: boats that are sailing, trains that are riding, a rocket that can be launched, … A lot of the miniature settings have buttons that children can press on, making a certain item of the set get into motion. Get ready for some action! We loved it there, especially because it was very hot when we visited the park. 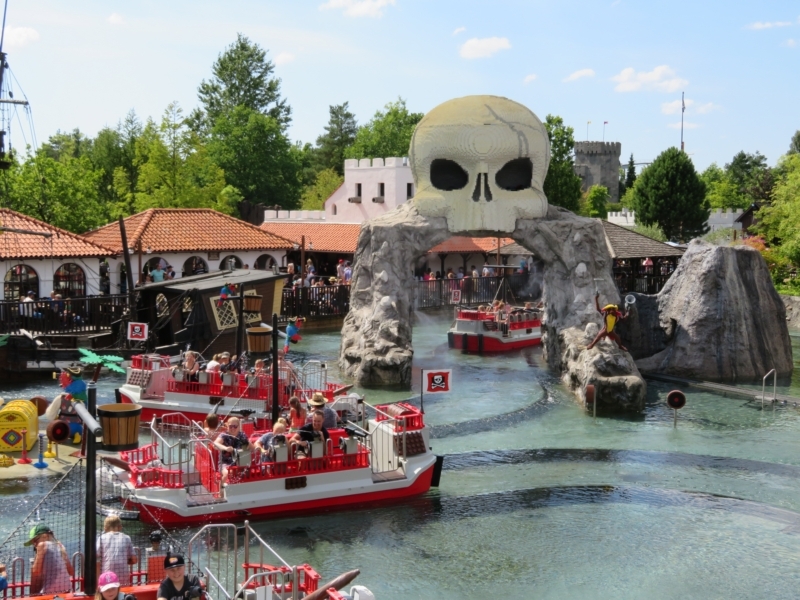 The ‘Pirate Splash Battle’ is about the only ride in it’s genre we did so far where you can actually get soaking wet. All very fun to battle agains other families and see that both adults and children are having the time of their lives! Febe loved the ‘X-treme Racers’ the most of all rides in the park. It’s a ride that’s a bit ‘wild mouse’ themed, but you ride in lego cars, that almost tip off every corner. There’s also a massive drop, leading to an extreme speed – very thrilling indeed! 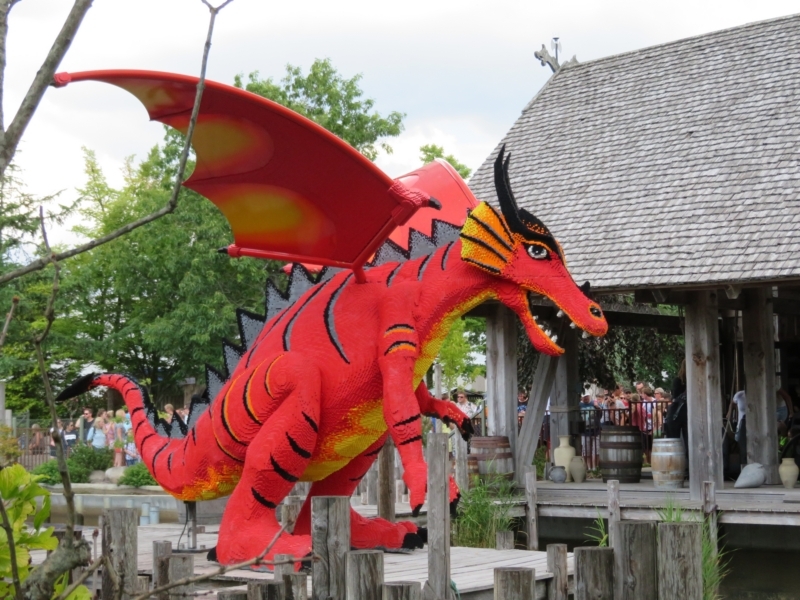 With two excellent rides (‘Viking River Splash’ and ‘The Dragon’), it’s an area we visited several times. With her friends from Lego Friends. With rides for the smaller visitors, this is the only area we actually skipped with our 8 year old. 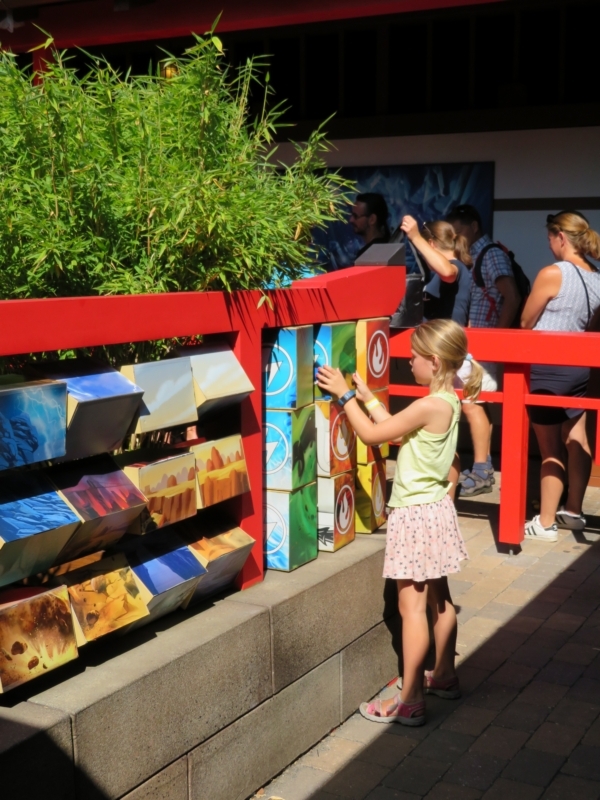 Beautifully decorated, and both ‘Ninjago – the ride’, where you get to shoot with a lasergun and ‘Lloyd’s Lazer Maze’, where you have to choose a lazer maze you have to pass through as fast as you can, are great attractions. 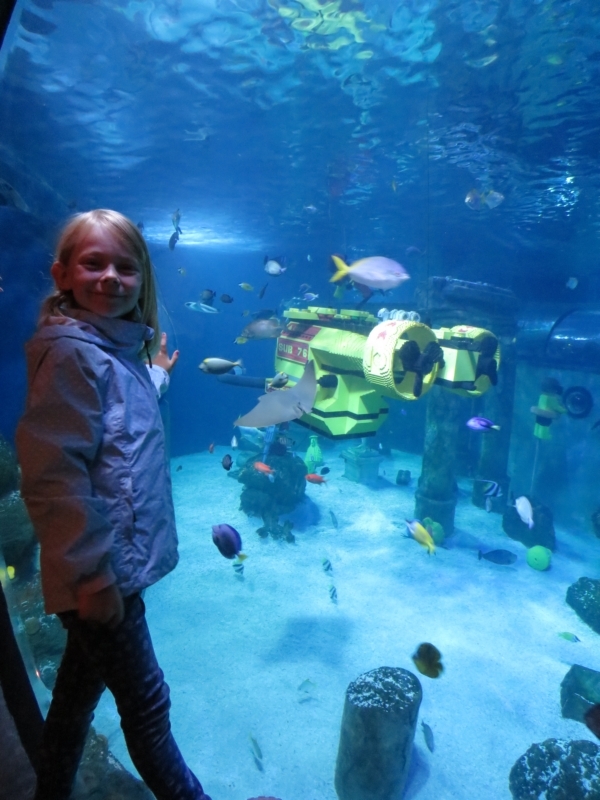 A beautiful set of aqariums, ofcourse, all decorated with Lego Treasures to spot. It’s really fun to spot the Lego builds in each aquarium. No matter where you look, there are huge lego-figures around to amaze you. A giant dragon garding the ‘Viking River Splash’, Lego friends on a bench near the entrance or a huge spider at ‘The Haunted House’, just to name a few. The park is spotless clean and the flowerbeds are well maintaned. There’s not a lick of paint that’s not in top condition – all things we sometimes notice in other theme parks, that make your overall experience just a tad less. Kids probably won’t notice all these smaller details, but adults sure do. I hear you thinking, aren’t all theme parks kid-oriented? Well, yes, but Legoland goes the extra mile. Waiting times were not that long, compared to other themeparks we’ve been to. On the days we were there, the park was really crowded, but we never had a waiting time that went over 30 mins, and that’s short. We remember being in line for more than 90 mins in Disneyland, and most Belgian themeparks often exceed the 60 mins as well. 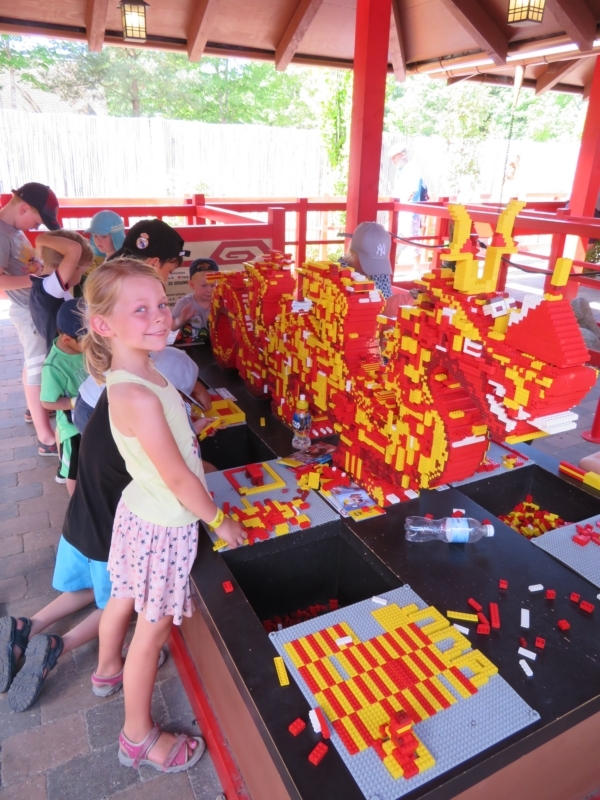 Not only is it way more comfortable to have short waiting times with a kid, Legoland even makes waiting fun for the children. Each waiting line has a central area where children can go play. Often they have legoblocks to build with, sometimes it’s other fun things, like puzzle panels. As a parent you walk the line, going around this central area, and you have to call in your child just as you enter the final 5 or 10 minutes. A feature a lot of other theme parks should pick up! A puzzle to play with. 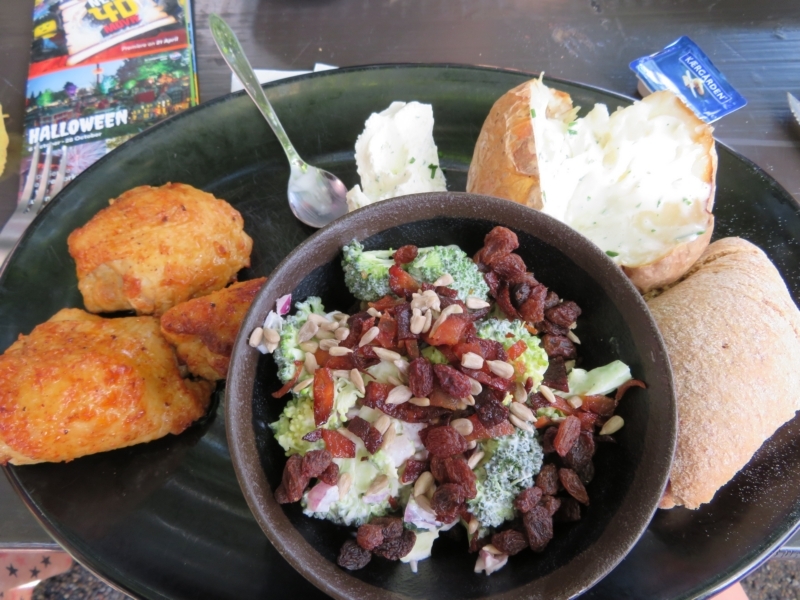 Most themeparks don’t really offer great food. It’s mostly junkfood, and not even the best tasting. At Legoland you have several dining options. We picked the buffet style pizzeria in ‘Polar Pizza and Pasta’ ‘Polar Land’ and the ‘Saloon’ in ‘Legoredo Town’. The ‘Polar Pizza and Pasta’ is an all you can eat buffet, with good pizza’s and pasta’s on the menu. All you can eat is not really necesarry for us (we are small eaters), but a buffet to choose from is always a good idea with children. The bonus was a good view on ‘Penguin Bay’. The ‘Saloon’ amazed us. The food was really good (we had grilled chicken, with vegetables and oven potatoes), the price was more than OK, and we had enough to eat to make us almost skip dinner. A real tip if you’re ever there! 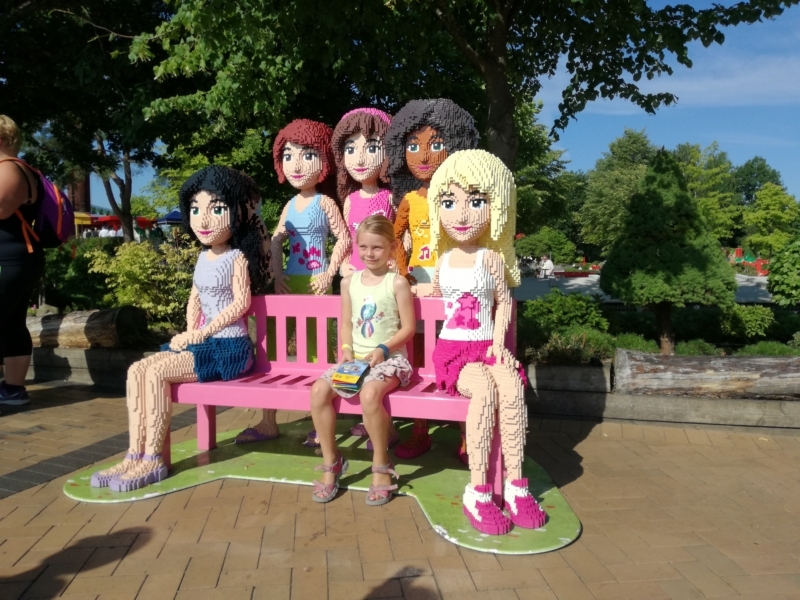 Though the price of the Legoland Hotel kind of knocked us over (we didn’t book one of the fairytale rooms there…), we really loved the Legoland Holiday Village. 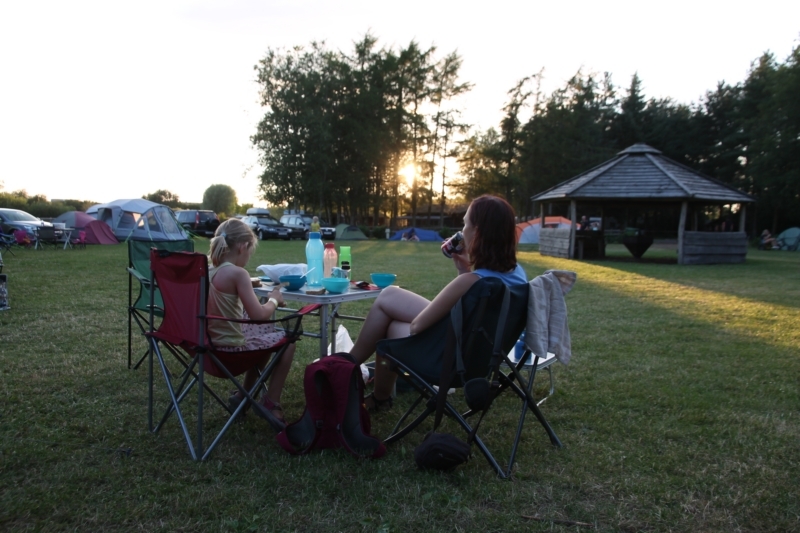 Only a 5 minutes walk from the entrance of the park, the village offers cabins for rent, a place to put your caravan or mobile home or you can pitch your tent there – which we did. The village has several open spaces with a central barbecue (in a convenient hut), where everybody pitches a tent in a wide circle around it. 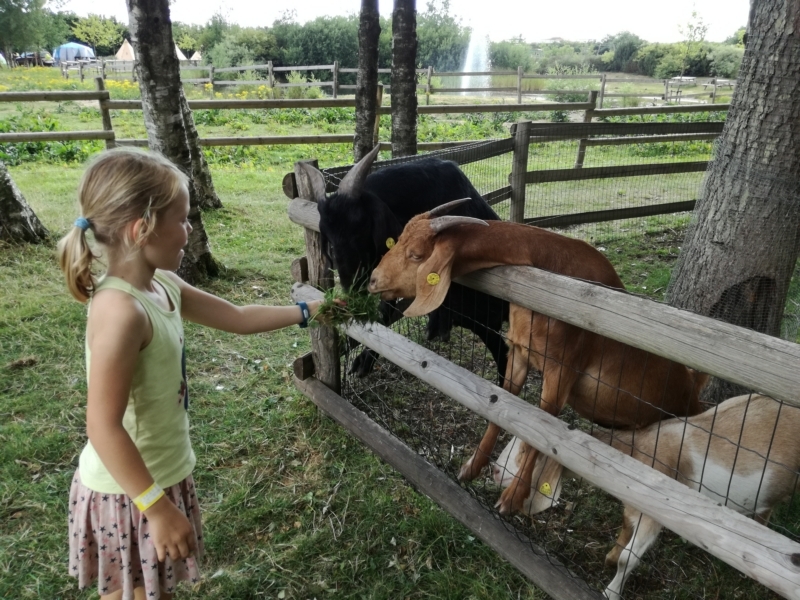 We were located near the small petting farm (Febe adored feeding the goats, and the goats where happy with all the childrens’ attention they got!) and it was a very relaxing place to camp. Even though there were a lot of people staying there, the are never felt too crowded. 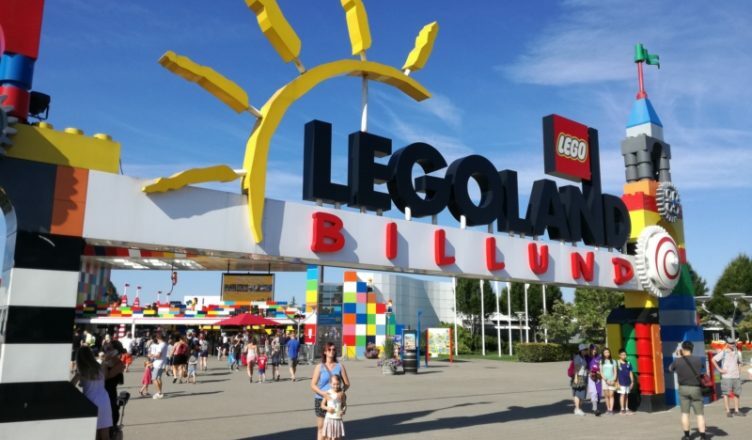 The village has several playgrounds (all lego-themed, ofcourse), the shower & toilet facilities are also lego-themed, and a small shop near the entrance where you can buy some food and basic groceries. They even had a treasure hunt on the grounds (which proved to difficult for us though, but that’s mainly because we didn’t take out enough time for it). The best bonus was that camping there and getting access to the park for two days, was actually cheaper than buying two days entrance for the park without the accomodation. Something really worth looking into! 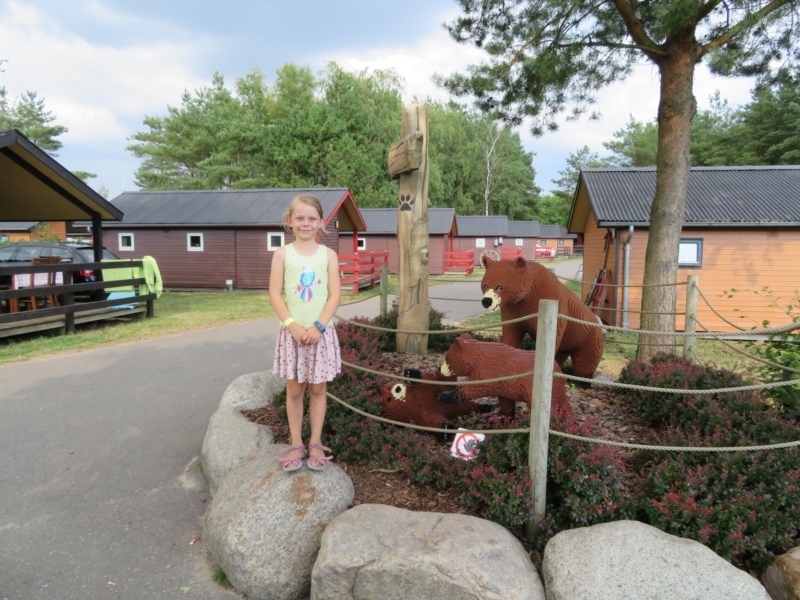 The cabins and statues at the Holiday Village. Relaxing over dinner after a long day of fun! We hope we’ve convinced you to make the drive into Denmark & visit this great themepark. If you need inspiration on other things to do in Denmark, our previous trip there might give you enough inspiration to make it a full holiday. Enjoy!